The first stage of emergency conservation and structural repair works are now underway at Her Majesty’s Ballarat. Ballarat contractor AW Nicholson Pty Ltd has won a $3.3 million contract to begin the first stage of works for the 143-year-old performing arts landmark, which is listed on the Heritage Register. 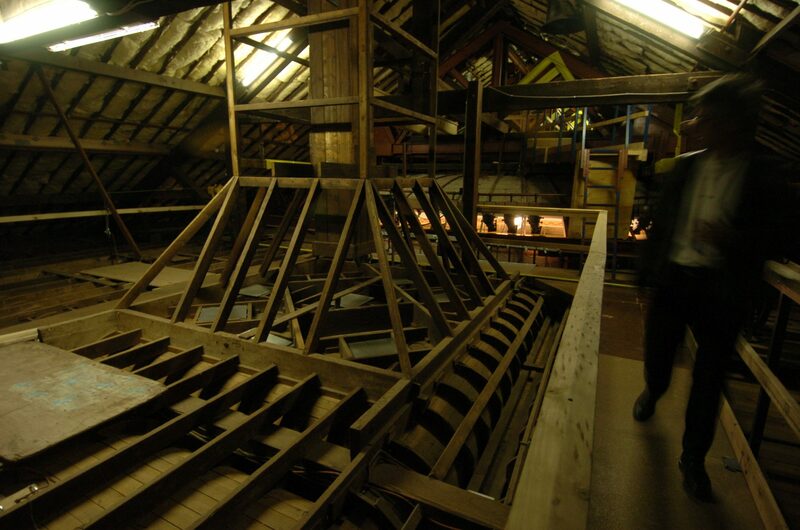 The works include reinforcing and remediating the roof structural trusses, demolition and reconstruction of the stage, localised roof sheeting replacement, internal guttering, drainage works, damp remediation works, plaster repair works, and fire and lighting service works. Stage one is the first step in realising the greater vision for the building – to not only maintain but also to improve the quality, accessibility and functionality of ‘Her Maj’, bringing this 19th century theatre into the 21st century – giving it a new lease on life for generations to come. AW Nicholson, which also built Ballarat’s Mars Stadium, is expected to begin works within the next few weeks. The first stage of the project – the conservation works – are expected to be completed before the 2019 Royal South Street Eisteddfod. The emergency restorative works are jointly funded by a $2 million grant from the Living Heritage Program, provided by the Department of Environment Land Water and Planning via Heritage Victoria, and the City of Ballarat – which allocated $5.3 million in its 2018-2019 budget to help fund the works. 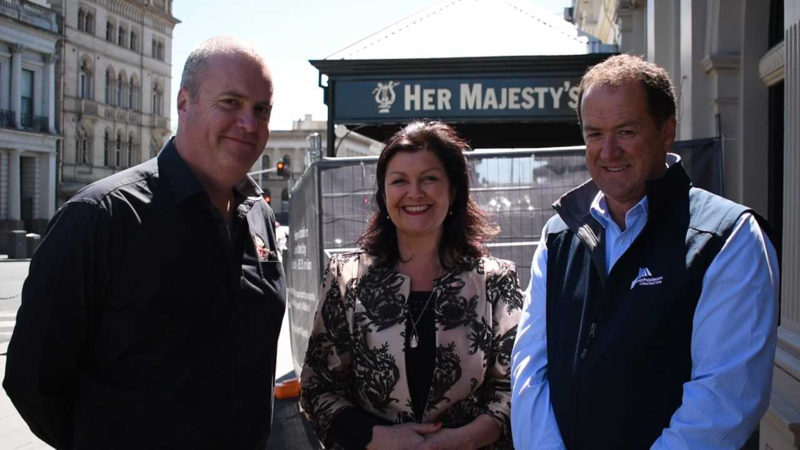 In July, the City of Ballarat launched the Save Her Majesty’s Ballarat – The Time Is Now campaign. The campaign calls on state and federal governments to provide the additional $15 million required for the next stage of works to secure the future of Ballarat’s foremost performing arts venue, ensuring the theatre is safe and can once again open its doors to performers, patrons, staff and the wider community. The campaign has already resulted in the community rallying to save the historic gem. A significant number of people have visited savehermaj.com to register their support and others, including comedian Carl Barron, have left messages on the online Wall of Support. The Save Her Majesty’s Ballarat – The Time Is Now campaign will fund a range of major works to improve the quality, accessibility and functionality of the theatre, such as adding accessible toilets and accessible seating, upgrading the existing lifts at front and back of house, a new entrance and foyer works, including box office and refreshment bar, signage and display system. These works will also include improvements to the fly systems, dressing rooms and the Long Room. Works are currently underway at Her Majesty’s to address conservation heritage features and improve the structure and safety of this iconic theatre. With the aid of a $2 million-dollar Living Heritage grant provided by the Department of Environment, Land, Water and Planning (DELWP) via Heritage Victoria, the first stage of the works is underway. This work includes localized replacement of the roof and internal box gutter, as well as external façade repairs and stormwater system remediation. It further addresses significant rising damp remediation, upgrade of fire safety systems and emergency lighting systems, conservation works to heritage urinals, and remediation works to trusses over stage with minor structural repair works over the auditorium. These works are due for completion by February 2019. The City of Ballarat has allocated $5.3 million in its 2018/19 budget for the next stage of works, the completion of which would allow for the safe reopening of the venue but would not guarantee the longevity of its future. 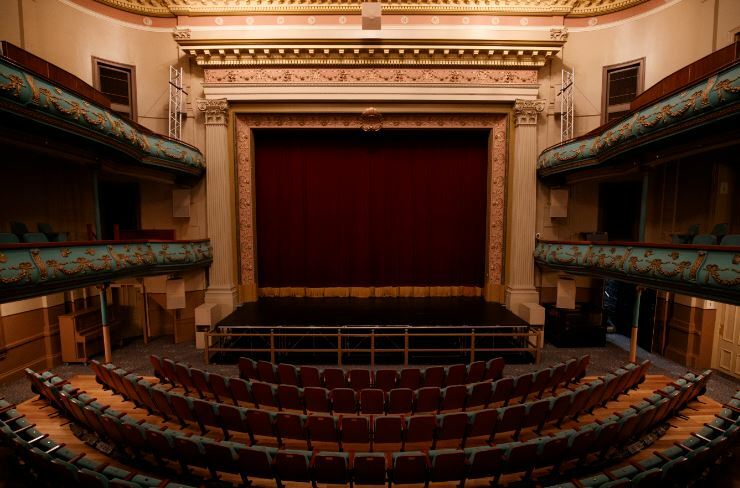 These works will include structural renewal of the stage, development of a comprehensive fire strategy and implementation of recommended works, an upgrade of the existing passenger lift, works to improve balcony and balustrade safety, provision of accessible toilets, and provision of accessible seating in the dress circle. These works will also include a new box office and refreshment bar, foyer signage, and display system. The further $15 million-dollars is being sought from the state and federal governments and would guarantee the ongoing operation and safety of Her Majesty’s for generations to come. These works would include an upgraded and expanded wing space, new passenger lift to stage area, new power flying system, new extended fly system, new green room and large dressing room, installation of the thrust stage/new orchestra pit, refurbishment and fit out of administration space, and installation of a quiet room. There is much to be done, and we can’t do it without your support. Visit the Wall of Support to add your voice to the campaign or donate here to contribute to the capital works required at Her Majesty’s. Every voice and every cent counts and will make a difference.